Free hotel wifi: Light at the end of the tunnel? The subject of internet connectivity in hotels has received quite a bit of attention during the past few weeks. I posted about my experiences with hotel internet connectivity while in Las Vegas and in Amsterdam recently, highlighting a nice way to balance the negative side of this – in my recounted experiences, one offering free connectivity but wired only, no wifi (Luxor, Las Vegas); the other (Crowne Plaza in Amsterdam), imposing an unwelcome charge for the privilege – with a way to get all your devices online without paying extra using a neat tool like Connectify that creates a “personal wifi hotspot” on your Windows laptop or netbook from your single internet connection. Last year, James Cridland wrote about his experiences with Hilton Hotels and how, in James’ view, they are hiding their wifi charges from customers when they book rooms in various Hilton hotels across Europe. Much weariness with all of this is apparent in a post a few days ago by my podcasting partner Shel Holtz – a frequent business traveller who stays in hotels a lot – in which, following a good experience with wifi at a Delta Hotel in Canada, he writes an open letter to the hotel industry saying that the time for free hotel-wide wifi has come. From reading both of those posts, it brings to my mind once more the cost puzzle of trying to understand what is the relationship between the price many (most) hotels charge you for internet connectivity, whether wired or wifi, and the cost to them in providing it. […] New problems have popped up too. Guests are getting dinged with internet charges per device (cellphone, tablet, laptop, etc.) because hotel WiFi networks are too antiquated to handle multiple devices per room. But we’ve got the numbers on how much it costs a hotel to install and maintain a decent network and there’s no reason why hotels should be charging us for this service, which is just as important as air conditioning and working toilets, other than it’s an easy revenue source. And there we come to some very interesting numbers, as this snapshot from a compelling infographic HotelChatter produced shows. […] We’ve spoken with a few internet service providers and some candid hotel executives about the cost of WiFi and for a 250-room hotel, the cost is about $2.50-$4.50 per room, per month. Hotels on average charge $13.95 a day for WiFi. You do the math. If you still need help, check out our infographic breaking down the costs. In short, the cost of hotel WiFi is purely a marketing decision. Many hotels resist giving the WiFi up for free because they would be turning their backs on an easy source of revenue. But Michael Strauss, director of finance for the Bryant Park Hotel in Manhattan which recently began offering WiFi for free, said, “[WiFi] is like electricity and water now. We don’t charge our guests for that. It’s expected.” Let’s hope that more hotels can be as brave as BPH and start offering it for free. All of this is by way of understanding what’s historical and seeing the shifts that actually are happening – HotelChatter says that the overall picture is more positive than negative, with 60 percent of hotels it surveyed offering free wifi. While I can’t tell how this compares to HotelChatter’s 2011 report – they don’t give the percentage for that year but the 2011 infographic look like it’s about 40 percent – it’s an improvement without doubt. If hotels make WiFi free for all, which I think they should do, I’ll be curious to see what new benefits they offer to their most loyal customers. Thanks for that detail, Jeff. HotelChatter includes extensive commentary about loyalty programs and wifi in their report. I hear mixed reactions from friends, though, about such programs. You may get free wifi but often it seems it doesn’t work, it’s slow or there’s some other problem, all negating the perceived benefit. Of course that would affect everyone if it were free. Adds some credibility, I think, to a view that too many hotels haven’t updated their infrastructure. 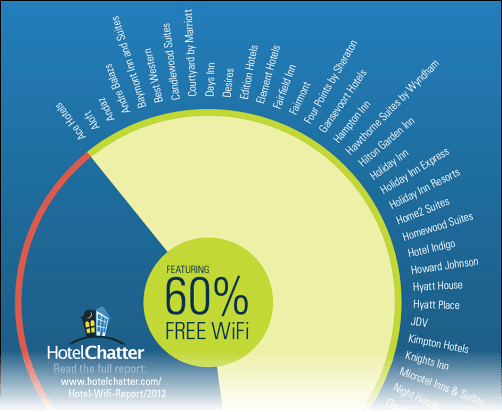 Still, the trend is clear, according to HotelChatter – more free is on the way. I’m torn on this one: I expect free wifi in hotels (though it’s not a deal breaker 90% of the time) and in my room but one hotel was telling me that a real danger to them is that when they do free wifi in the rooms, people go to their rooms and just stay there. They don’t go to the bar, they bring in their own food/drink and stay in their room. What they do now is make wifi free in their public areas – the lounges, receptions and bars (the restaurant was an area of debate last time I checked as some felt it should be concentrating on the food and real life chat amongst those present) – and that has a few benefits: to anyone who comes into the hotel, it looks busy and vibrant. Also, people then buy drinks/nibbles from the bars, helping the hotel stay profitable. It’s an interesting conundrum and all too often I think some of us forget hotels have to make money to stay open! Hiya Craig! I know what you mean, but seriously, if I go down to the bar area to use the wi-fi, have a drink and something to nibble on, I rather prefer to switch off my devices, don’t get connected and *talk* to people F2F while they are in there. It makes for so much more fun than checking what’s happening with your Web work. Sometimes we keep forgetting how powerful F2F conversations are and hotel bars are probably as good as it gets while on the road… right? Craig, I lump such explanations in the same bucket as those you hear from organizations when they want to restrict employee access to social media. Or, back in the day, when people were worried that providing links to content on other websites from their own site would encourage people to leave and go to those other websites! These attempts at control won’t work in the long term, especially as free wifi (or, maybe better said, freer access to wifi) becomes more common in hotels, as HotelChatter’s report suggests. Hi Neville, thanks much for putting together this fascinating article! I, too, agree that we are close to reaching the tipping point where not just hotels, but our governments, need to understand the huge amount of hours wasted while on the road staying at hotels not having a good reliable Internet connection. It’s big business for hotels, indeed, but a huge productivity drain for everyone else! And it’d be interesting to see how much long the EU would be putting up with it when thousands and thousands of road warriors keep wasting precious time being disconnected and not being able to do Web work. That’s one of the reasons why I’ll never go and stay at *any* NH Hotel that offers Swisscom as their wi-fi provider as I have mentioned in the past on this blog post. That’s why having a free wi-fi connection at hotels is no longer good enough. Not even if you are using the free Ethernet. It needs to get better than that. It needs to be fast and reliable, and faster again! And the funny part is that we are not asking for rocket science innovation over here, as I have blogged just recently as well over at “I Think I May Have Just Experienced The Future…”. Luis, thanks for such good insight. I read your post, great accounts. You raise timely issues – I agree, this needs to be way beyond the simple provision of easy access to getting online, to offering an outstanding experience in doing so, just as you noted from your recent travels. I’m currently in a hotel in Dublin writing this comment. I’m online in my room with a paid connection (€9.99 for 24 hours) and I have my Connectify hotspot running with mobile devices also connected. I’d rather the fee was included in the room rate, thus making me feel good about getting “free internet”. But I’m ok to pay a reasonable price, really, as long as the experience is good. And it is, although I have to log out from one device if I want to connect another (my phone, for instance, if I go elsewhere in the hotel). Still, some places are moving in the right direction, according to HotelChatter’s report. And of course, if a hotel won’t make it easier, then companies like Connectify will fill that gap.